Management often looks for returns to justify the financial and labor investment into employee wellness programs, just as what they would do in other business initiatives. 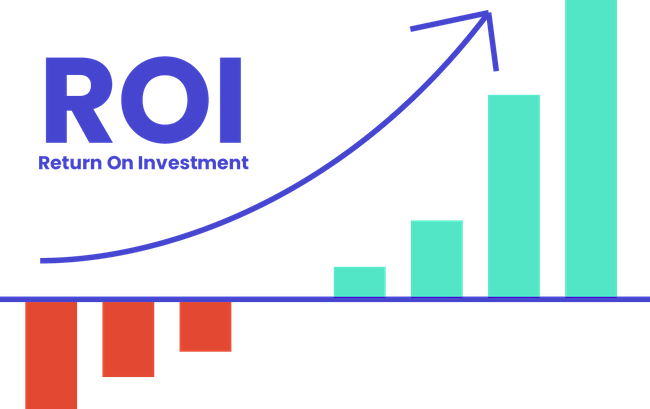 Two types of perspectives usually come up: return on investment (ROI) and value on investment (VOI). Here’s a quick look at the differences between these two assessment methodologies. The basic premise of measuring ROI is that an organization invests in employee health hoping to eventually extract lower health care costs in the future. Traditionally, ROI has been a popular way for executives to justify a wellness program, especially for organizations focused on cost containment. Unfortunately, ROI is a limited set of goals, and research indicates that employers actually have many reasons for offering health and wellness programs outside of just cutting health care costs. Additionally, to accurately measure the value of any program, the metrics need to be based on the reason for initiating it. Given the fact that employee wellness programs are (and should be) based on many holistic improvement metrics, they cannot be authentically evaluated unless more outcomes are measured than the amount of medical cost savings. 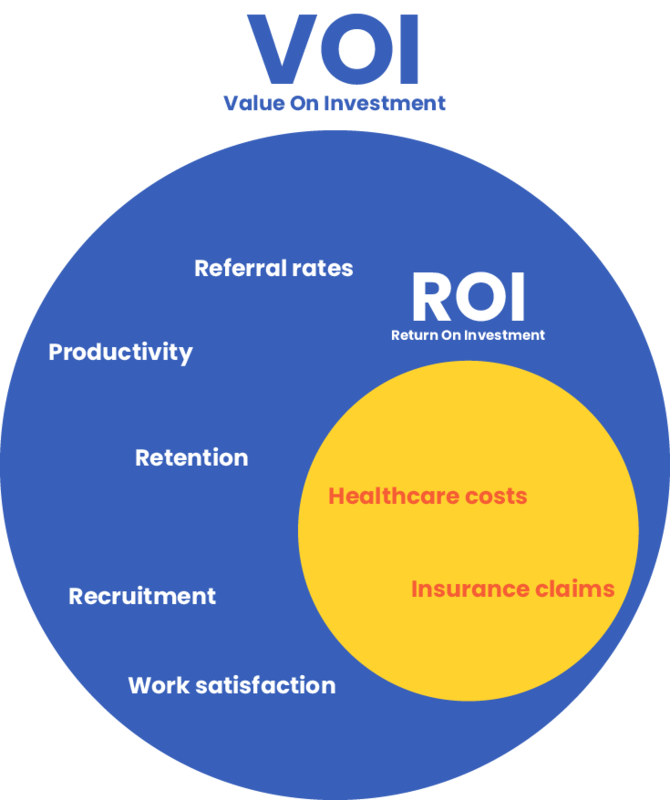 ROI on wellness programs (reducing claims and health care costs) is only a subset of the true value of investment. Another reason to be wary of ROI in wellness programs is that studies on this metric have largely been debunked. The infamous Harvard Business Review research that proved a 6:1 ROI for wellness programs has been proven inaccurate and so have other industry case studies that act more as marketing materials than true scientific investigations. If wellness programs have not proved to lower health care costs, why are companies still investing in such initiatives? Simply put, there is a lot to be gained from taking care of employee health beyond lower health care expenses. VOI is a broad measure of all the benefits conferred by employee health and wellness programs. It is important to note that moving the focus to VOI does not mean that there are no financial returns to be had from wellness programs. Simply put, VOI benefits go beyond lower health care expenses and include such metrics as productivity, employee morale, retention, and satisfaction, all of which impact an organization's bottom line. When this broader context is taken into account, companies are able to achieve a complete view of program effectiveness that goes beyond dollar to dollar cost. On the strength of this view, organizations can then fine-tune their wellness programs. Some of these key value-on-investment metrics are easier to track than others, but few are beyond the reach of data. Examples of such tracking include measures of employee engagement, safety incidents, absenteeism, turnover, and business profitability. Many companies already track this data but don’t analyze it in relation to workforce health. There is a direct linkage, for example, between employee wellness programs and the all-important ability to attract and retain talent. A company consists of people, and anything that promotes a healthy lifestyle for those people will naturally benefit almost all of an organization’s key performance indicators (KPIs). Below are a few ways in which these connections are directly validated. Productivity is the third most popular reason for investing in health. That should come as no surprise given that unwell employees cost U.S. employers about $530 billion in annual productivity. This is due to both absenteeism as well as presenteeism, a term used for workers who show up feeling ill. There are other, subtler effects of less-than-optimal health in the workforce. For instance, one study shows that obese people exhibit poorer decision-making skills, and helping them lose weight improves cognitive functioning as well as delivers other health benefits. Sitting for too long also leads to cognitive decline, and the availability of standing desks for employees has been demonstrated to result in higher productivity. Sixty-two percent of employees with wellness programs felt their program boosted morale and increased their productivity, and 56% reported having taken fewer sick days because of their program. Finally, the topic of stress and mental health has an important part in any discussion about productivity and wellness. Stress hormones pose health risks for human cognitive ability, and knowing that paid sick leave is available decreases employees’ stress levels. A problem with measuring productivity is that it is hard to track. In theory, productivity can be measured by dividing business outputs (such as calls made, services produced, etc.) over the total number of employees. However, in an organization with many departments, only a few of which are actually client-facing. Business outputs rely on a small subset of employees while other departments work to keep the business running in the background without direct attribution to the products. On top of that, the quality of the output is as important as quantity, adding another layer to the assessment. The bottom line is: measuring productivity is tricky business, but it can be done. 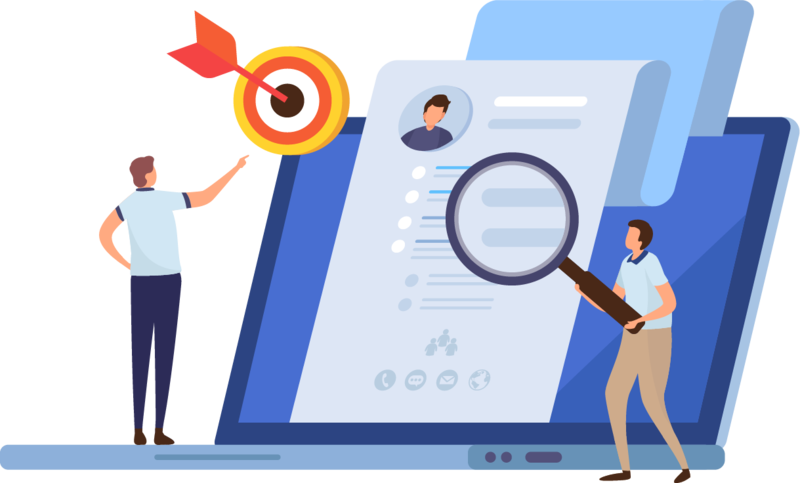 Many organizations and teams now measure their productivity based on hitting departmental and personal goals, with standardized systems like KPIs. Additionally, employees can rate their own level of productivity. While self-report data should be used with caution, when combined with the metrics mentioned above, provide a more complete picture. Measuring productivity this way is not only good for justifying wellness programs, but it is also crucial in propelling the organization forward from a business point of view. Replacing an employee costs between 20% and 213% of their annual salary, according to the Bureau of Labor Statistics, and over 3 million people quit their jobs every month of 2018. This quit rate is nearly at a 17-year high, and those workers are searching for something better. Today’s employees, especially millennials, look for a company that cares about their wellbeing — and backs up that caring with concrete actions. Compared to productivity, employee retention is much easier to track. The formula is relatively simple: divide the number of employees who left during a period by the total number of employees at the end of a period to get the percentage. Research demonstrates that worker satisfaction correlates closely with whether or not an employer has a wellness program. Of employers offering wellness programs, 67% reported increased employee satisfaction, 66% reported increased productivity, 63% reported increased financial sustainability and growth, and 50% reported decreased absenteeism. The most popular approach to measuring employee satisfaction is the employee satisfaction index (ESI). Because there are multiple ways to calculate ESI that is beyond the scope of this article, head over to the Hubstaff blog to learn more. 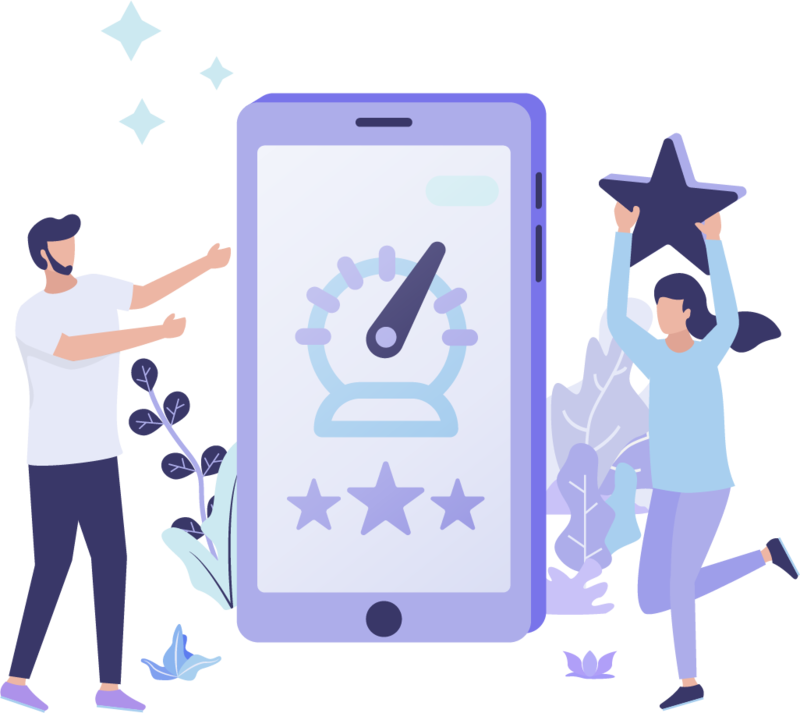 There are also many HR platforms with built-in satisfaction and engagement measurements. The list for VOI metrics is long, so let's throw in a catch-all category call "other." 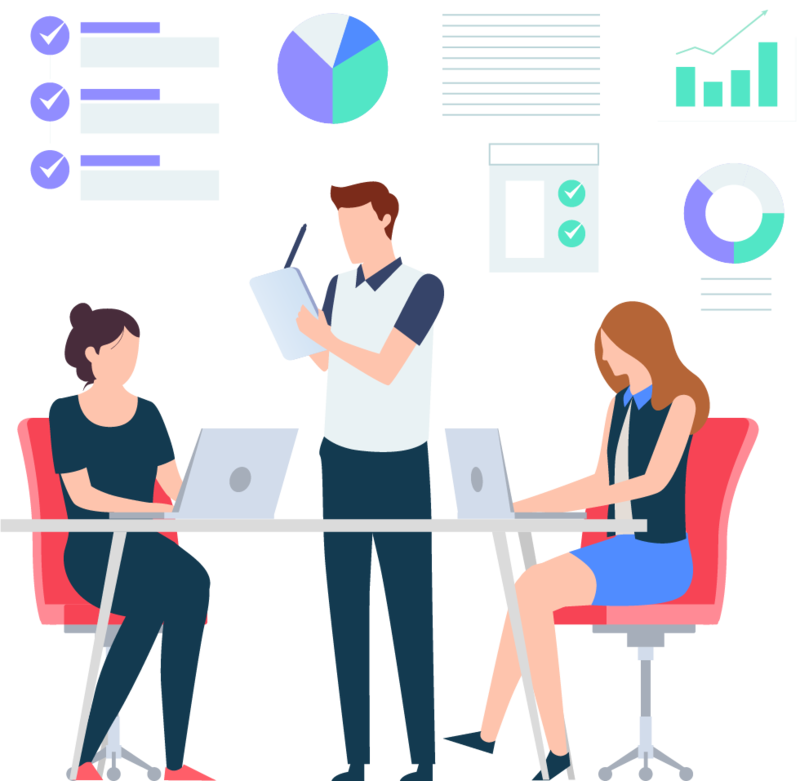 In this category are metrics that pertain to the organization's specific business goals, whether it is revenue, operation efficiency, scope of impact, etc. In many cases, wellness program effectiveness can be reflected directly in the business outcome. This is simple to understand: team members who feel healthier and more positive about their job will have an influence on everyone they come into contact with. Metro Nashville Public Schools, for instance, saw better student test scores after launching a wellness program for teachers. Considering the business objective of the school system is to educate students, improving their standardize score is a cause to celebrate and a solid reason to continue to invest in such a wellness program. Depending on the organization's goal, this metric will look different for different programs. By definition, most organizations are already tracking these core business outcomes, and simply need to correlate the data with employee wellness program participation. So, what’s the best way to optimize VOI on wellness programs? In most cases, it is simply a matter of improving employee engagement and utilization in the wellness program that has been put into place. There are several tried-and-true methods. Multiple channels of communication: Employees cannot participate in programs that they are not aware of. 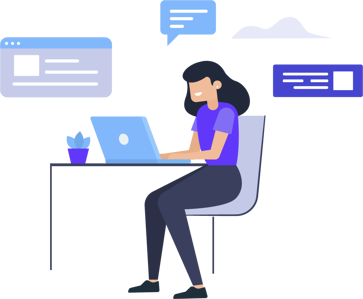 Organizations can get higher engagement rate by making sure to inform employees of the program through a broad range of communication channels, such as emails, internal communication tools, flyers, social media, etc. Generating excitement through word-of-mouth is another effective channel to recruit participants. Variety of offerings: The most successful wellness programs have a wide range of offerings available to participants. This is because people have different needs, and they will only engage in a program if it addresses those needs. A good program should include all major markers of holistic wellness, such as mental health, physical activity, stress management, and nutrition, and is delivered through a variety of programs such as webinars, activity tracking, and informational articles. Leadership support: A study from the Health Enhancement Research Organization (HERO) found that leaders of top-scoring organizations that publicly recognized employees for healthy actions and outcomes and served as role models for prioritizing health and work/life balance were more likely to report employee health improvements and medical cost improvements relative to organizations that did not have public recognition from leadership. Programs without leadership support and engagement are simply checking the box. By having leadership involved, the organization is truly building up its culture of health. Ideally, offering wellness programs should lead to healthier employees, which eventually lead to lower health care costs. However, measuring ROI has been an elusive goal for most employers. Instead of focusing on dollar-for-dollar cost savings, organizations should adopt a value-on-investment measurement framework. Once these holistic metrics are captured and analyzed alongside data on engagement in wellness programs, organizers can paint a complete picture of the program effectiveness and start fine-tuning their wellness offerings. When the VOI of a wellness program is measured, the organization's profitability will reflect the true extent of benefits that arise from a healthier workforce.